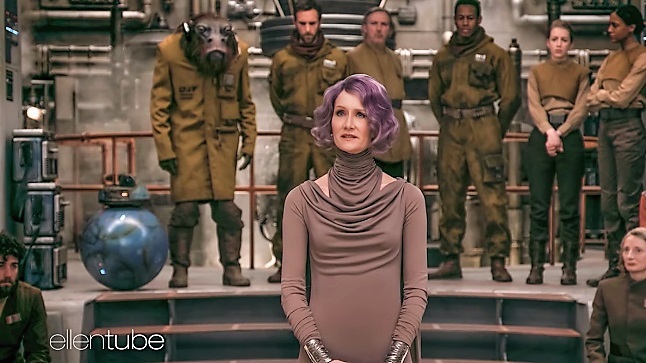 STAR WARS AFICIONADO WEBSITE: EPISODE VIII: ENTER AMILYN HOLDO! POSSIBLE SPOILERS! 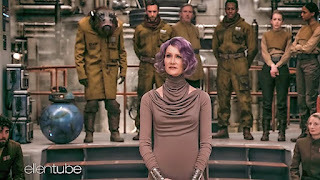 A vital new supporting player for the Resistance struggle comes into play for The Last Jedi and likely Episode IX in Laura Dern's striking Vice Admiral Amilyn Holdo. Very much in the Mon Mothma mode, though not afraid to take arms in battle, she will surely be the torch bearer, alongside Poe Dameron, to the cause against the First Order passed on from the departing General Leia Organa at the end of VIII. It's great to see a new picture of this sure-to-be-popular character, clearly in a key meeting with other operatives and droids (of which this film will showcase a wide variety).